These clients live in a lovely low-rise condo in Dallas. 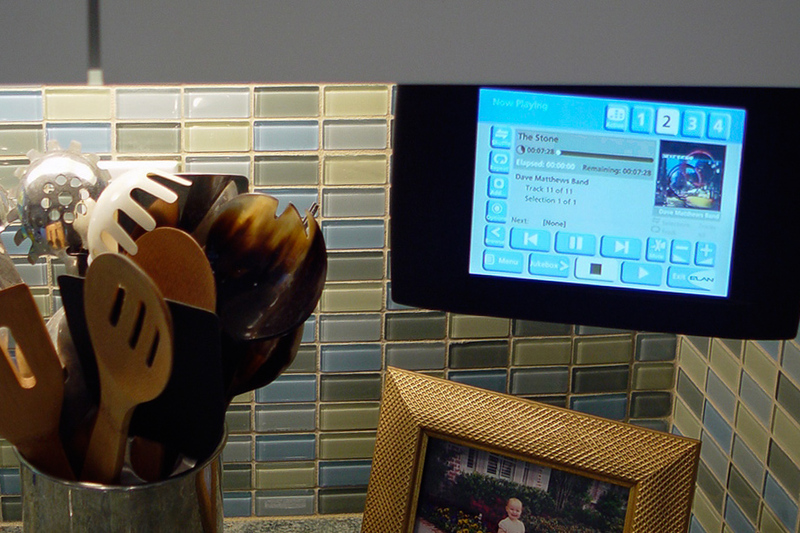 She LOVES music, and asked us to add wonderful sound to her kitchen. We selected a pair of versatile high-gloss white speakers from Totem, which sound beautiful, and blend well with her kitchen finishes. We added a small-but-mighty sub-woofer from Episode so that our clients can enjoy good, solid music while on kitchen duty. iPad control provides a wide variety of streaming music options. This couple asked us to incorporate their television into their kitchen photo gallery. They share vacation photos with family and friends by displaying them on the TV. They also have access to their favorite shows recorded on the DirecTV DVR (digital video recorder). UltraMedia offers several brands of in-wall speakers that blend well into different environments. We like Revel and Leon for their quality build and visual appeal. This home owner wanted her grandchildren to feel right at home. So, she asked us to incorporate a docking station to play their music. Audio components are hidden in a closet, and there are Triad in-ceiling speakers in the kitchen. Technology is controlled with an RTI handheld color touchscreen. This kitchen in downtown Dallas boasts a wall-mounted 60" Zenith plasma TV with aluminum frame to match the stainless steel appliances. 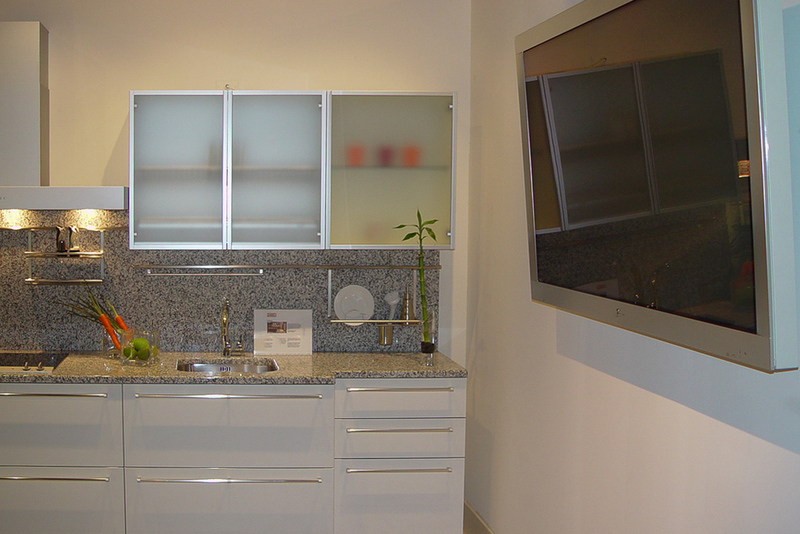 This flat-panel displays our client's cooking shows, the big game, and CNN updates. A touchscreen remote gives viewing access to their kids in the pool. This is a convenient under-cabinet flip-down screen. These screens can display everything from the front-door security camera, to your favorite cooking show. They can be folded down when needed, and positioned to the most comfortable viewing angle. Or, they can be tucked up out of the way when not in use.